Sir Thomas Doughty (sometimes spelled Doughtie) was executed by Sir Francis Drake on July 2, 1578 in Argentina. This engraving is "The Beheading of Captain Doughty by Drake" by John June, probably 18th century. The gallows in the background had been used by Ferdinand Magellan in 1520 to execute one of his men. The reason given to the public for Drake's voyage was exploration. But Queen Elizabeth made it clear to Drake that his real mission was to sack Spanish settlements and plunder their ships. Thus the nickname history has given Drake: the Queen's Pirate. As they had fought together in Ireland, Drake hired Thomas Doughty to be his second in command. He also felt the need to explain to Doughty the real purpose of the journey. This upset Doughty and he spoke to a friend in Parliament. At that time, Parliament didn't want to provoke the Spanish as England and Spain were finally enjoying a few peaceful years. Word came back secretly to Doughty from Parliament that when Drake began his plundering, Doughty was to incite a mutiny among the crew and overthrow Drake. Doughty did as ordered, but the plan backfired. Doughty was tried for treason, witchcraft and mutiny. Many in the crew knew Doughty had been set up and questioned Drake's authority to pass judgement on Doughty. 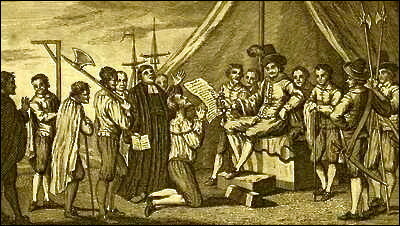 It was suggested that when they arrived in Peru they leave Doughty there to fend for himself or even delay the trial until they returned to England. However, feeling threatened and pressured by Drake and his closest friends, a jury of crewmen reluctantly found Doughty guilty of mutiny only, and Drake sentenced him to death. That evening, Drake and Doughty shared communion. In his contemporary account, Francis Fletcher wrote, "And after this holy repast, they dined also at the same table together, as cheerfully, in sobriety, as ever in their lives they had done aforetime, each cheering up the other, and taking their leave, by drinking each to other, as if some journey only had been in hand." Next morning, Doughty was beheaded. Many in the crew were upset. To give them something else to focus their attention on, Drake re-named his flagship the Golden Hind as they sailed through the Strait of Magellan. Thomas Doughty's brother John was also on board the Golden Hind. He had been accused of the same crimes as his brother, but the charges were dropped. In June of 1579, as the ship was anchored in a bay on the Pacific coast, John Doughty became the first of the European side of our family to set foot in North America. When they returned to England, John Doughty brought a wrongful death lawsuit against Drake. To protect Drake, Queen Elizabeth threw a wrench of technicality into the proceedings, and the lawsuit resulted in a mistrial. The execution of Sir Thomas Doughty has inspired several engravings, two movies, two plays, several poems, articles and essays, and an online fan club whose members write original stories of Drake and Doughty. Convinced that they were more than just shipmates, they refer to the duo by their in-house nicknames of Sea Dog and his Puppy. Though Doughty's trial is considered by most historians to have been a sham, it nonetheless established the precedent that a ship's captain was its absolute ruler, regardless of the rank or social class of its passengers.